If you live in Missouri, you have noticed the wonderful yo-yo weather we have had lately. The perfect weather for getting sick. We have had colds and even my parents were struck with the flu last week. ICK! So I decided it was time to make a Cold and Flu Preparedness Kit. To me, the key ingredient to this cold and flu preparedness kit is Kleenex® Anti-Viral* Facial Tissues. I purchase my Kleenex® Anti-Viral* Facial Tissues at Sam’s Club. With two small children, having tissues on hand is a must. The 12 pack comes in very handy since I can stash them in all the rooms of the house! 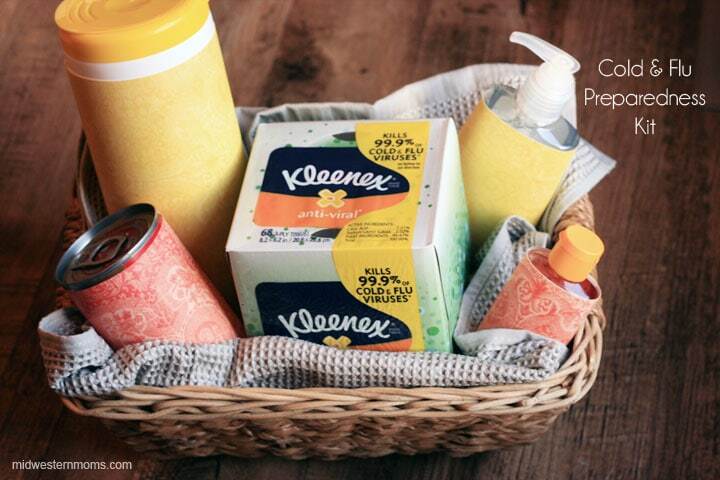 Why Kleenex® Anti-Viral* Facial Tissues over any other tissues? They are constructed of three layers of tissues which makes them strong when you need them. Less likely to get a red nose due to the softness of having a three layered tissue. What to have in your cold and flu preparedness kit? What do you have in your kit?